Go birdwatching with a Birdingpal from Mississippi. I can cover from Jackson out to the southwest of Mississippi. I am an intermediate level birder. 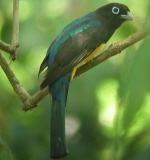 We are avid birders and have birded hotspots around the country and some in the Caribbean and Central America. We are located very close to the Homochitto National Forest and about 50 minutes from St. Catherine Creek National Wildlife Refuge. We commonly see almost all species that occur in the southeastern U.S., including some specialties such as the red-cockaded woodpecker. I am a longtime avid birder from the coast and very familiar with the Coastal Counties of Mississippi. I am avid birder and member and former board member of the Jackson Aubudon Society. I lead field trips and 1st Saturday bird walks in Le Fluers Bluff State Park for Jackson Aubudon Society. I am also a member of the Mississippi Orthnological Society and the American Birding Association. Currently I have a total of 360 species. I have birder in the South Texas, the Missippi Gluf Coast, Alabama, and Louisiana. I will be glad to help visitors by leading them on trips to LeFluers Bluff State Park in Jackson, MS, the Clinton Nature Center, or Pearl River Wildlife Management Area near Canton, MS. I enjoy birding and enjoy birding with others.